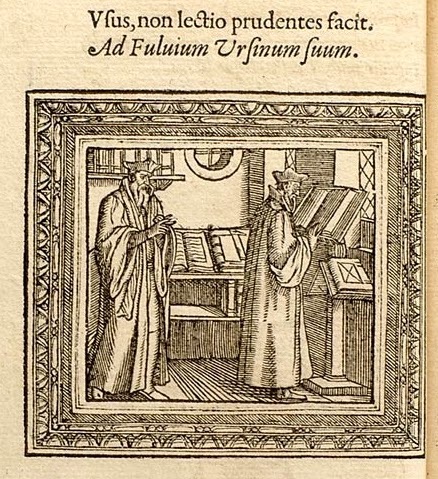 Johannes Sambucus, Emblemata (1564), p. 62. Image: Glasgow University Library. The language we use to describe how we interact with various forms of information technology betrays the distinctions we make between these forms. To a print publisher, I am a reader; to a software company, I am a user. That is, we read books, but we use digital devices. This distinction, however, depends both on a very narrow sense of read and a somewhat artificial distinction between reading and use, and should be challenged. To begin with, the meaning of the word read has changed a great deal in the history of English. Old English rædan meant ‘to advise’ or ‘to consult’; the shift from this original meaning to the modern one signals a shift from consulting people to consulting documents. But when medieval readers consulted documents, they did so in ways that may seem foreign to us: for example, more often than we do, they read aloud and in social contexts. And during the long span of the Middle Ages, reading practices shifted in ways that many scholars have found significant. One of the first things we noticed when examining the ways in which people approached documents in early medieval England is that people did a lot of other things with them besides reading them. A book could be venerated as a relic, for example. Text could be encoded to impede rather than to facilitate communication. And it was common to reuse or repurpose manuscript parchment to make new books or even to make things that were not books at all. These observations have led me to suggest that ‘reading’, in the sense of transferring textual information in a linear code sequence from a book to one’s mind, is only one of the uses to which textual information can be put, and that the narrow modern sense of ‘reading’ is associated with a specific model of text, one option among several. But this should not surprise us: even today a book might never be read, but might instead be used as a doorstop, a paperweight, a source of notepaper, or an accessory to a bookshelf to give visitors the impression that you’re a great reader even if you aren’t. ‘If the children of men wish to use me . . .’ – and then it lists the benefits of using this book, which include health, success, wisdom, happiness, and really good friends. Old English brucan meant ‘to use, enjoy’; it survived (barely) into modern English as the rather archaic verb brook. In early medieval England, you read people, and used books. In early medieval England, you read people, and used books. The idea that books (particularly the Bible, or any other devotional book) needed to be not merely ‘read’ but also used, that is, deliberately allowed to influence one’s thoughts and life, continued well into the early modern period. William Sherman, arguing for the language of use rather than the language of reading in the preface to Used Books, cites as a precedent a motto from Geoffrey Whitney’s Choice of Emblems (1586): Usus libri, non lectio prudentes facit, ‘The use, not the reading, of books makes us wise.’ (See the image above for an earlier variation from the Emblemata of Johannes Sambucus.) Francis Bacon declared, famously, in his essay ‘Of Studies’ (1601), that ‘Crafty men contemn studies, simple men admire them, and wise men use them’. Nonconformist preacher Richard Baxter in his theological manual A Christian Directory (1673), explaining the advantages of reading books over listening to preachers, wrote that ‘Books are (if well chosen) domestic, present, constant, judicious, pertinent, yea, and powerful sermons: and always of very great use to your salvation’. So there are advantages to thinking of readers of books as users of a particular form of information technology. Too often we think of ‘reading’ as the passive, private, immersive experience of perusing a text in a linear and often unreflective way: that is, ‘reading’ means positioning a document before one’s face and moving one’s eyes along the lines of text, decoding them as one does so. Sometimes, indeed, we do read like that. But the idea of ‘using’ a document carries with it an implication that the relationship between reader and text is interactive and functional. Just as the user of a software application or digital device performs certain tasks, provides input, makes choices about what to access, configures the data, and often becomes involved in a user community, readers of medieval and early modern books were also supposed to use them: for the health of their souls, as platforms for interactive commentary, in nonlinear ways, by reinterpreting the data, and as the basis for ‘textual communities’. Historically, at least in English, readers were users in these ways. A book was a tool you did stuff with. Furthermore, for medieval and early modern people, merely reading a book was a waste of time: one used a book so that it had a transformative effect on one’s ideas, character, and conduct. We may or may not share such high ideals for our books; but still, rather than creating an opposition between ‘reading’ and ‘using’, we should think of readers as users. The image from the Emblemata of Johannes Sambucus is from Alison Adams et al., French Emblems at Glasgow, Glasgow University Emblem Website, accessed 2014 June 30. Baxter, Richard. A Christian Directory. Vol. 2 of The Practical Works of Rev. Richard Baxter, ed. William Orme. London: James Duncan, 1830. The phrase ‘textual communities’ was coined by Brian Stock in The Implications of Literacy:Written Language and Models of Interpretation in the Eleventh and Twelfth Centuries (Princeton: Princeton UP, 1983). In the world of new media, these terms are being used increasingly as interchangeable. With ebooks, authors often work with media technologists, and so they flop back and forth between the two synonyms for "customer". In the world of interactive books and multimedia systems, the two terms are not only interchangeable by convention - their actual meanings become indistinguishable. And that's as it should be. Thanks for the reminder.